Time :- 01:30 Am (India). Venue :- Brian Lara Stadium. Tarouba, Trinidad. Pitch Report:- Fair Cricketing pitch. support for both Batsmen as well Bowlers but Bowlers may dominate over Batsmen. Score upto 120-135. * South Africa is losing this t20 series by 2-0 & chance they will bounce back hard & give tough battle to Windies. * Windies women looking so strong in this battle & already leading this series by 2-0. # Date :- 30 September 2018, Sunday. # Timing :- 07:30 Pm (India). # Venue :- Kanteerava Stadium. Bengaluru, INDIA. 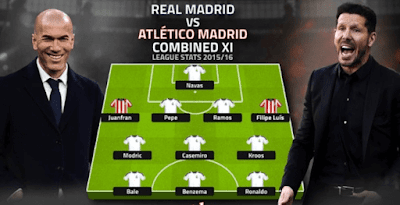 Spanish Fantasy League (LA LIGA) Date :- 30 September 2018. Sunday. Timing :- 12:15 Am (India). Venue :- Estadio Santiago. Bernabeu, Madrid. South Australia vs Victoria (Aussie ODD Cup)NEW: South Australia - SAU: *Cameron Valente is injured, so he will not play today’s match. Victoria - VCT *Will Sutherland is out of the tournament due to injury. *Fawad Ahmed is added in squad and is expected to feature in today’s match. 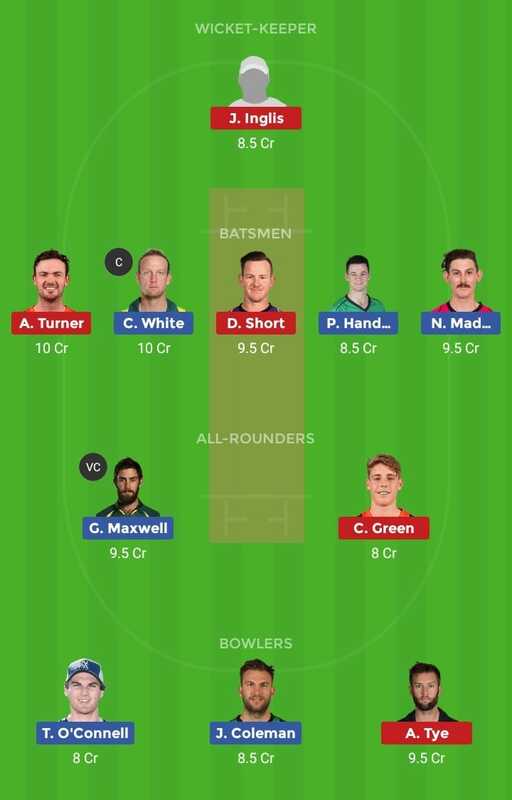 *Chris Tremain is also declared fit, so he will also come back in playing lineup. Atletico De Kolkata vs Kerala Blasters (ISL) Time: 6 PM IndiaTEAM NEWSAtletico de Kolkata *Prabir Das, Arnab Mondal and Andre Bikey are sidelined because of his injury concerns. Kerala Blasters *Abdul Hakku is injured and is most likely to miss out on this game. *Anas Edathodika has to serve his suspension which he picked up in the last season. *Cyril Kali remains a serious doubt to play in this game. *Ashleigh Gardner was suffering from a concussion, has made a successful return against Cricket Australia XI in warm-up match. She scored 39 not out off 29 balls. *Young spinner Georgia Wareham is in line for her T20I debut. NEW ZEALAND-W *Lea Tahuhu and Amelia Kerr each took three wickets in the warm-up match, Amelia Kerr was excellent in NZ’s last campaign. *Maddy Green was the player of the match while Sophie Devine and Suzie Bates opened the innings. *Sophie Devine was in excellent form during her stint in England with both bat and ball. PREDICTED LINEUP AU-W: Alyssa Healy (wk), Beth Mooney, Ashleigh Gardner, Meg Lanning (c), Elyse Villani, Rachael Haynes, Ellyse Perry, Nicola Carey/Delissa Kimmince, Megan Schutt, Sophie Molineux, Georgia Wareham. - Hertha suffered their first loss of the season on Tuesday when they were beaten 3-1 at Werder Bremen, but remain just three points off their upcoming opponents. - They have also been forced into a change in goal with first-choice Rune Jarstein going off at half-time in Bremen with a bruised leg. It means former Bayern man Thomas Kraft should deputise as he did on Tuesday. - Thomas Kraft will start in goal after injury to their first choice goal keeper. - Plattenhardt, Lazaro, Rekik should all play in defence. - Valad Ibisevic will lead the line with Dilrosun, Kalou and Dudo suppoting him. # Date :- 28 September 2018, Friday. # Venue :- Dubai International Cricket Stadium. Dubai. # Pitch Report :- Fair Cricketing Pitch. Support for both Batsmen as well as Bowlers. Pitch is good for Batting & Spinners also get grip from the Track. Score upto 270-280 is challenging here. * Indian team is unbeatable in this Asia Cup & in great form & most favourite for this Asia Cup title. * All rested Senior Players will be back in Playing 11 including Rohit Sharma, Shikhar Dhawan, Bhuvneshwar Kumar, Jasprit Bumrah & Yuzvendra Chahal & Rohit Sharma will lead the side. * Bangladesh Star All-Rounder Shakib Al Hasan is out of Asia Cup due to Finger Injury. * Bangladesh will be in full confidence and top form because they beat Pakistan to reach in Final & they may surprise India in Final. Team News:Victoria:Chris Tremain has been ruled out of this week’s JLTCup matches as a precaution due to back spasms, fast bowler Zak Evans comes into the 14-player squad. India will take on Afghanistan for the 5th Odi match of Super four of Asia Cup 2018 going to be be played on 25 september 2018, Tuesday at Dubai International Cricket Stadium, Dubai. India Vs Afghanistan 5th Odi Dream11 prediction Asia Cup 2018 is given in this post with all key stats. Afghanistan: Most probably they will not make any changes. Afghanistan will take on Bangladesh for the 4th ODI match of Super four of Asia Cup 2018 going to be be played on 23 september 2018, Sunday at Sheikh Zayed Stadium, Abu Dhabi. Bangladesh Vs Afghanistan 4th Odi Dream11 prediction Asia Cup 2018 is given in this post with all key stats. 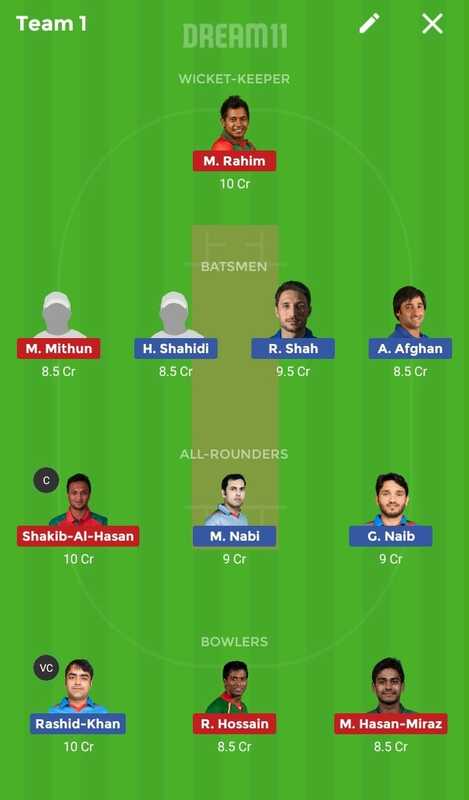 Team News: Afghanistan: No changes are expected in the playing XIBangladesh: Tamim Iqbal has been ruled out of Asia Cup 2018.Imrul Kayes and Soumya Sarkar are added in the squad for remainder of the series.Both openers are in very poor form both are risky.Soumya Sarkar and Imrul Kayes Anyone one or both will play.